How many people are dreaming to go to study at Oxford? For many academics, beginners or advanced, a scholarship in the old European city of sciences is a confirmation of the hard work and a ticket to universal scholarly recognition. In my case, as I put on hold my academic life for at least another 2 semesters, Oxford was only a stop of my first big trip to discover Britain. When I arrived in Oxford, it was raining. The grey sky of London prepared me for this, but the weather never deter me to accomplish my travel plans. Fortunately, it was only a summer rain that ended up in a couple of minutes and a couple of hours later, when we left, the summer sky clear sky was back. Regardless of the weather changes, the town continued to be crowded and the clicks of the cameras weren't covered by the cries of the street guides offering their services for general or specific town tour. In small and big groups, from Asia or other parts of Europe, the tourists were everywhere. In the shops, restaurants, hotel lobbies and around the big local tourist objectives. The big disappointment was the lack of lockers at the bus station that complicated our journey through the town. After a couple of failed attempts to get a storing space in some of the central hotels, we decided that we don't have any no other way but to carry with us our not so gracious luggages. During the walks, the music was always in the background. Either jazz or some classical pieces, or even some tango or music from the '20s that encouraged not a few couples to start dancing in the street. 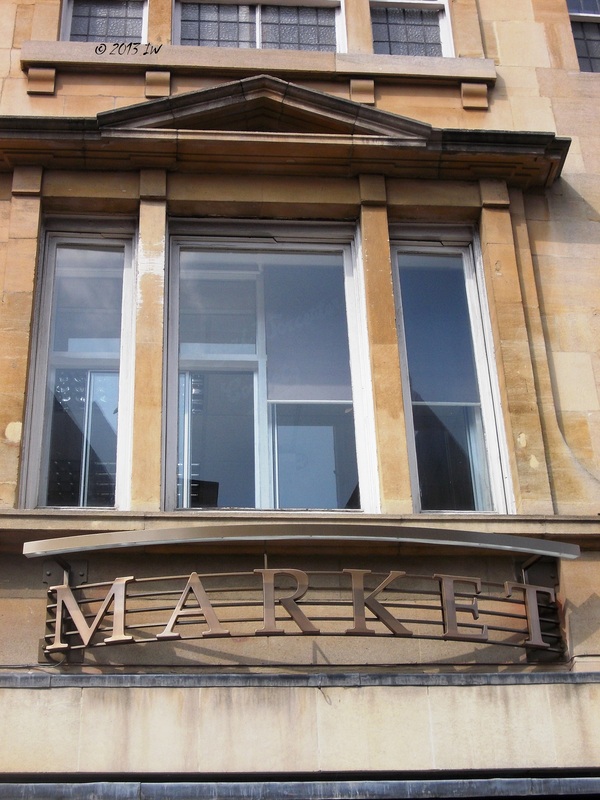 Miles away, London was taken by the Notting Hill carnival, but in Oxford, the classical balanced style was the rule. Street musicians, happy to share their talents with the tourists were everywhere creating a familiar and happy ambiance. 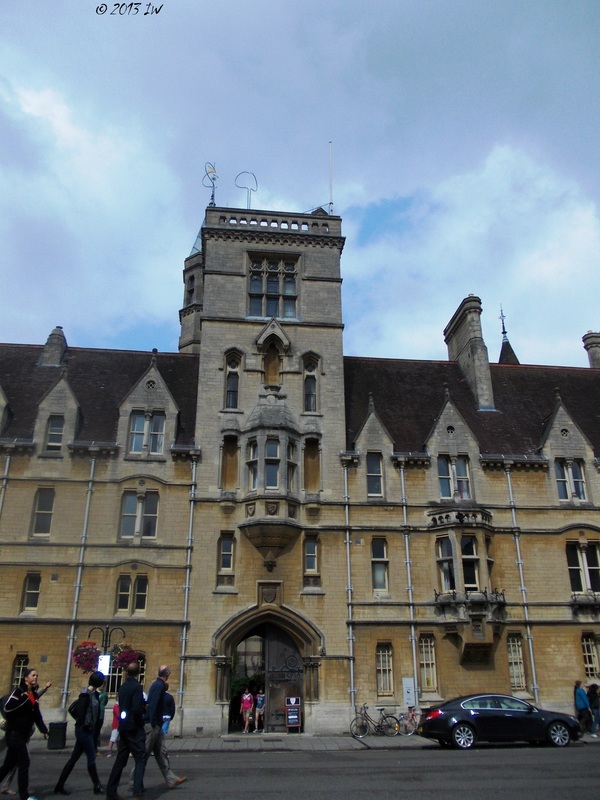 After seeing the town hall building and entering the yard of the Bodleian Library - that I promise to visit at length the next time - we walked the less crowded streets, admiring the combination of old middle age architecture with some Art Nouveau and Arts and Crafts spots along the way. This visual diversity creates a balance into the urban perspective: the old style sophistication can be overwhelming and the simplicity always brings a note of humanity into the landscape. The restaurants - including some kosher options - and various coffees looked fashionable and elegant, but who have time to stay and eat when there are so many things to see and look around? Not me, in any case. I preferred to do not have any coffee till the end of the day trip for saving precious time for seeing and feeling more of Oxford. Taking the full advantage of the bank holiday, I did a little bit of shop hopping and ended up at the local market. Shortly after entering Oxford, I saw a big area of tents announcing the Foodies Festival that later during my British trip I saw in Birmingham too. But it was too far away to the center to visit it. Instead, the local market showed me samples of local products, from a cute hat shop to various fruits and vegetables and cozy coffees, where the busy student can relax before another immersion in the complicated world of sciences. A couple of hours spent in Oxford were enough to bring the poetry back into my head. But this is not what I wanted to happen, and worried to get rid of the spell, we run away back to the bus station, for reaching Birmingham till the end of the day. For more pictures from Oxford, have a look at my Pinterest board.